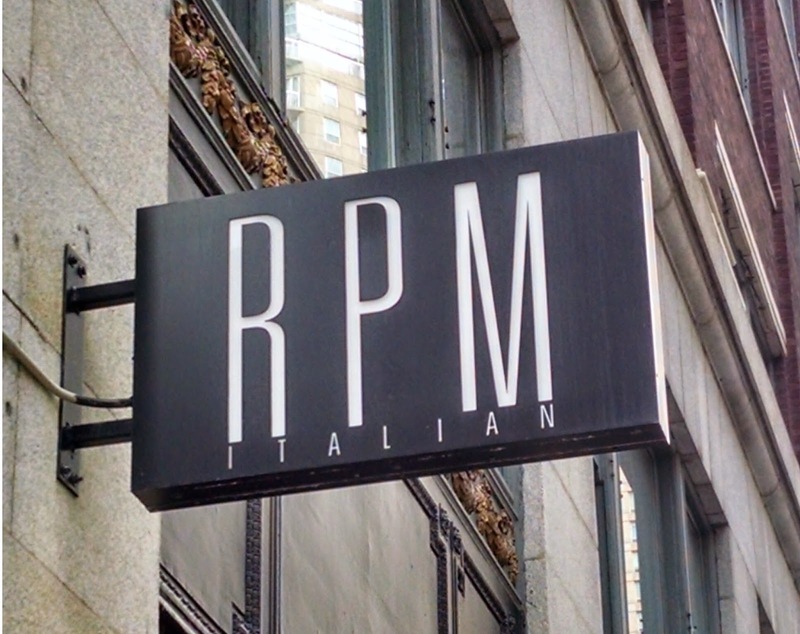 Last Sunday, we had the pleasure to dine at RPM Italian. Danny including. The restaurant is the brain child of celeb couple Giuliana and Bill Rancic, Lettuce Entertain You's Melmans and chef Doug Psaltis (thus the RPM in the name). The menu features a couple of family recipes from Giuliana's mom, aka Mama DePandi. First, they have a valet, which is a must for me at a downtown restaurant. If you're lucky enough to drive an exotic pasta rocket, expect it to be parked right in front of the restaurant for the duration of your meal. The restaurant's decor is ultra modern and in only two colors: black and white. Think Milan, not Florence. The maitre d's (there are two, both male) are very pretty. Not handsome – pretty. And exactly the same height and size. Models that serve? I suspect Giuliana had something to do with the staff selection. We arrived before our dinner host, and were allowed to wait by the bar. Note: in Chicago, kids are not allowed to sit right at the bar (against the liquor law), so if you're with a kid, grab a bar table. I had a Classic Bellini while waiting, Terry had a martini. Danny just bopped to music, they play club music but at a low soft level – just loud enough to make you interested, but without the headache. The restaurant is divided into two dining rooms so to speak: white on the left and black on the right. The white side is all open tables of two or four. That side was filled with first dates and adult city families that were too lazy to cook on a Sunday. We sat on the black side which is booths: big enough for parties of about 6, but private enough to have a conversation at a normal decibel level. Our table even featured a lovely "reserved" sign. The dress code: Smart casual. Which means guys could get away with a dark pair of denim and a jacket, ladies should of course dress on trend. There was a Louis Vuitton or a Fendi bag on every table, so you get the picture. Now the important part – the menu and service. They have a very extensive wine list, takes up the entire back side of the 11x17 menu. Wines are Italian of course. You can do by the glass, or bottle if everyone is planning on drinking the same color. We did bottles. The server will ask if you would like a fresh glass when they bring out a fresh bottle. There are lots of seasonal daily menu options, on Sunday it featured black truffles in almost every dish. The server was not only able to describe the dishes in detail but name the price, which usually is not done. She also inquired right away if we had any food allergies or dietary restrictions. The appetisers are cold and hot antipasti, cheeses and salumis, pizzettes, salads and cicchetti (which are Venetian small bites). Since RPM was our host's favorite restaurant, we went with her suggestions and ordered Meatballs, Frito Misto (tempura-style calamari, which was huge with just a hint of batter) and a Brussels sprouts and avocado salad. The meatballs were huge and melted in your mouth, Danny devoured the calamari, and the Brussels sprouts salad was a huge surprise (they were shredded, with chunks of avocado in a lemon and something creamy dressing). Next time I'm going to order the salad again, just to figure out what's in it. They do not have a children's menu, which was not a problem. Danny got freshly squeezed orange juice (they juice in-house for their Italian cocktails) and chef prepared a plate of freshly made cavatelli in butter sauce with lots of cheese on top. It arrived, it was placed in front of Danny, and it disappeared in a blink. Yes, all white pasta is made in house. Reason I say white is because they also serve squid-ink pasta, which is what I had of course. With spicy crab on top. Absolutely to die for. Terry had a slow roasted pork chop that had the crunchiest crust ever on a chop and melt-in-your-mouth inside; our host had salmon, which was also delicious and fresh. Portions are just the right size – you eat your entire entré without that heavy Italian food feeling and have room for a gelato afterward (also made in house). We had chocolate, pistachio, and coconut (but we told Danny it was vanilla). Gelatos are big enough to split. And yes, there is a gluten-free menu. Terry's espresso was forgotten at some point, when we inquired about it, it was promptly delivered gratis and with apologies. There is a 600-day prosciutto on the menu, we will be back for that one. A great place for a date, or to celebrate, or host someone. Reservations are a must. It's a place to see and be seen, the owners pop in often when on town.